A few weeks ago I talked about what you can find inside the purse of a typical Dog Mom. When I take Sadie out for a walk I regularly lug that full purse with me, stuffed with poop bags, tissues, some treats, my phone, camera, collapsible bowl, water bottle, etc. I’m always frazzled when we leave the house, worried that I forgot something. And it’s twice as difficult when someone else in the family wants to take Sadie for a walk and I have to make sure they have everything she might need. But with the RokaPets Dog Treat Pouch, I no longer have to worry about being prepared. 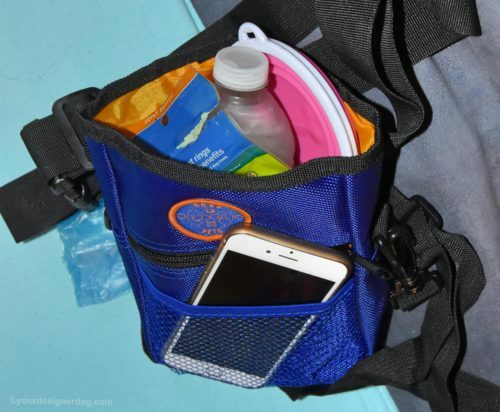 All of the essentials fit in a handy little wearable pouch. For me the RokaPets Dog Treat Pouch is great in terms of comfort and hands free convenience. I can wear it around my waist like a belt (and it actually fits my waist, which was a pleasant surprise) or I can use the belt clip instead and hook it directly onto my pants. My shoulder doesn’t ache from carrying a bag for an extended amount of time. 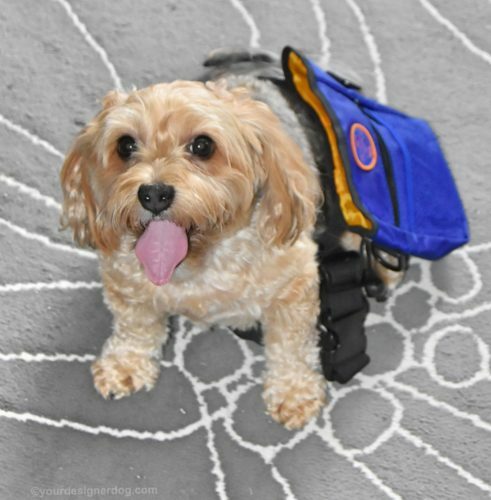 The Dog Treat Pouch is comfortable to wear around your waist for short walks or even extended hikes. And it’s absolutely perfect for spontaneous photography, which if you know me you realize happens frequently on walks with Sadie. I no longer have to juggle the camera and my purse and Sadie’s leash all at the same time. My hands are free to take all of the photos I want! But the RokaPets Dog Treat Pouch is especially useful for the other members of my family. All they have to do is put it on and go. No more worrying about transferring the necessities from my girlie purse when Sadie’s uncle or grandfather wants to take her out for a walk. 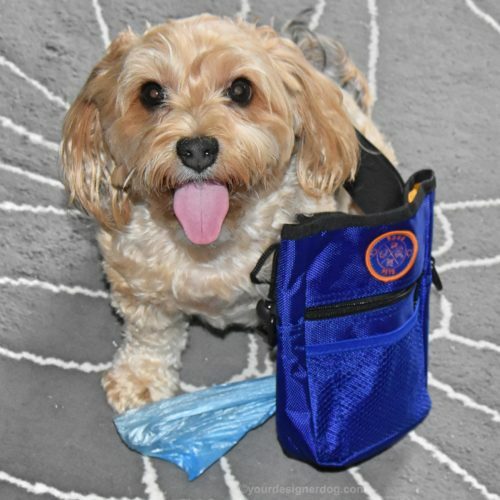 The RokaPets Dog Treat Pouch is stylish for both men and women in a pretty blue color that everyone can enjoy. There are four separate compartments to hold all the necessities in the RokaPets Dog Treat Pouch. The large, open, main compartment can handle everything from treats to a water bottle to a water bowl. In the back is a zippered section that holds the poop bags (one roll of poop bags included!). A zippered compartment in the front is perfect to keep necessities safe like your ID, credit card, or some cash. And lastly a mesh compartment in the front provides a handy place to keep your cell phone or other item for quick access. The material is waterproof and easy to clean, which is always a plus for any dog owner. It seems like the perfect pouch to stand up to the crushed dog treat crumbs and spilled water and grass stains that accompany the typical life with dogs. If you are looking for a convenient, hands free dog Treat Pouch, you can find the RokaPets Dog Treat Pouch on Amazon for $15.93. I received a free product in exchange for an honest product review. All opinions are my own.